The new action plan released today by Wilmar International, the world’s largest palm oil trader, is not fit for purpose and will not keep forest destroyers out of its supply chain, according to Greenpeace International. “Wilmar needs to prove its palm oil doesn’t come from forest destroyers. That means instructing its palm oil suppliers to publish maps that show they aren’t destroying rainforests, then cutting off the ones that refuse. Instead, Wilmar is trying to fob us off with voluntary agreements that its suppliers will just ignore,” said Kiki Taufik, head of Greenpeace’s global Indonesia forests campaign. In 2013, Wilmar became the first palm oil trader to adopt a ‘no deforestation, no peat, no exploitation’ policy that covered its palm oil suppliers. Last month, a Greenpeace International investigation revealed that Wilmar was buying from 18 of 25 palm oil groups that had cleared a total of 130,000ha of rainforest since 2015. Only a fraction of the palm oil Wilmar trades comes from its own plantations; more than 80 percent comes from other palm oil producers. 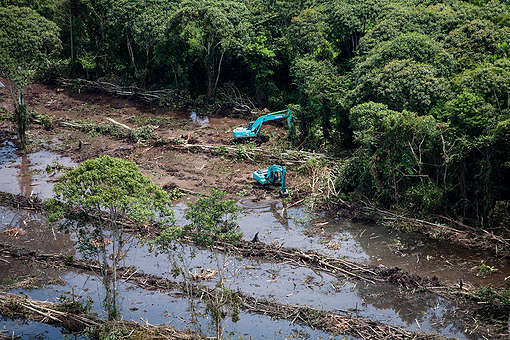 “Wilmar has been promising to stop buying from forest destroyers for five years. Today was its chance to make up for lost time by announcing a strong and ambitious plan. Greenpeace has tried to engage with Wilmar constructively, but Wilmar won’t commit to specific actions that translate into real change on the ground. This leaves its customers with no choice but to suspend trade with Wilmar until it can prove its palm oil is clean,” said Taufik. Publication of concession maps is not mandatory and there is no clear deadline for suppliers to meet. Instead, Wilmar ‘encourages’ suppliers to publish concession maps and promises to come up with another plan next year. Monitoring of Wilmar’s supply chain lacks key details of scope, baseline and the actions required of producers that are caught destroying rainforest. It is unclear how Wilmar intends to monitor its suppliers, as this requires concession maps, which suppliers are not required to publish. Wilmar sets the goal of a 100% independently verified ‘no deforestation, no peat, no exploitation’ supply chain by December 2020. However, the plan lacks the specific, timebound and measurable actions needed to achieve this. Greenpeace International used satellite imagery to identify 130,000ha of deforestation by 25 producer groups since 2015. 51,600ha (40%) was in Indonesian Papua with a further 26,100ha (20%) in neighbouring Papua New Guinea – some of the most biodiverse regions on earth and until recently untouched by the palm oil industry. When Greenpeace International approached Wilmar about these producer groups, it confirmed that it was sourcing from 18 of the producer groups. It subsequently stopped sourcing from several of the groups. Greenpeace mapping analysis based on Wilmar’s published mill and refinery information.